Are you thinking about recycling the scrap metal in some of your old items? Not sure how to recycle items that aren’t entirely made out of metal? You’re in the right place. This blog post will tell you how to prepare specific items for recycling, ensuring that you get the optimal payout for your recycling contributions in Elk Grove Village. Let’s begin. Due to their size, you might think that refrigerators would yield a good return as scrap metal. However, they don’t yield quite the return you might think they would. Generally, when recycling refrigerators, you can recycle the metal components that exist within them. These components are typically made of steel, and can usually be melted down to create new products. Note, however, that you should clean these components of refrigerant before recycling them. If you have any electric motors in your possession, they can be recycled. However, you should be aware that electric motors typically don’t yield a huge reward. While you’ll get some money for them, the amount of money you get will usually be limited. Typically, it’s a good idea to recycle an electric motor when it weighs 40 pounds or more. However, if it happens to weigh less, it can still be recycled. Do you have an old computer cabinet in your possession? Looking to recycle it? If so, you’re in luck; computer cabinets can be recycled. Now, you might be thinking that you’ll have to remove the components from your computer cabinet before it can be recycled. However, unless you have multiple cabinets to recycle, you shouldn’t. You can get a bigger return on your computer cabinet by turning it in intact with its motherboard, power supply, RAM, and other components. You more than likely have an old television or two laying around the house. Perhaps you’re interested in recycling these TVs? While parts of TVs can be recycled, entire TVs typically cannot be recycled. It’s recommended that you remove the wire and the copper component that rests at the back of your TV before you bring it to a recycling facility. There are also select metal recycling companies that might accept your TV as is. 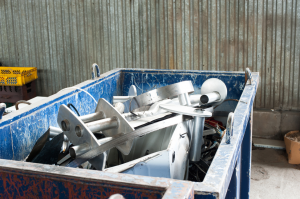 While you could sell entire microwaves to a metal recycling company, you’ll often get a better return out of them by removing their internal components and turning in those components separately. There are several components that can be removed from microwaves before being recycled. They include copper wire, support boards, and motors. AC condensers contain a great deal of scrap metal; not only on their exteriors, but their interiors as well. To get the best return on your condenser, it’s recommended that you remove its internal components. These components include everything from copper tubes, to motors, to aluminum fins, and more. It’s recommended that you turn in every component as a separate entity. Scrap metal items yield higher monetary returns when they don’t need to be separated. As far as recycling goes, washers and dryers are quite similar to AC condensers. These machines can be turned in whole, but will yield a higher reward when separated into individual components. The components you can get from washers and dryers include motors, copper wire, and copper tubing. Looking to Recycle Metal in Elk Grove Village? Do you have scrap metal that needs to be recycled? Looking to recycle scrap metal in Elk Grove Village? If so, we here at Central Metal Recycling are the people to see. Our team of seasoned metal recycling specialists is well-versed in the recycling of a number of different metals. These metals include aluminum, steel, brass, copper, e-scrap, and much more.